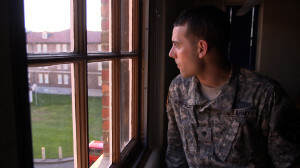 Adam Winfield at Fort Lewis, August 2011. Photo by Dan Krauss. 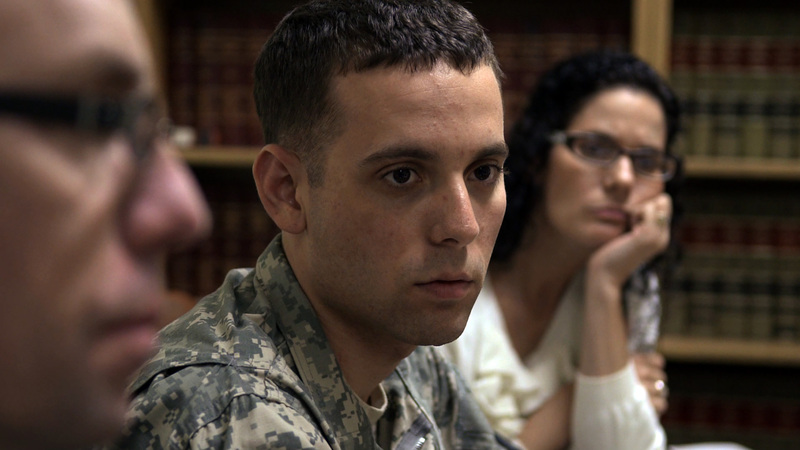 Adam Winfield at Fort Lewis, August 2011. Adam Winfield (center) with his parents, Chris (left) and Emma (right). Photo by Dan Krauss. Still, it’s not clear that Winfield brought his concerns to higher-ups in the military or sought to go public with evidence of the crimes. Instead, he recalls being threatened and intimidated by his fellow soldiers, including squad leader Calvin Gibbs, who is currently serving a life sentence for having spearheaded the crimes. No matter his conscience, he was, in the end, a bystander. None of this is to pass any moral judgment on Winfield, a 100-pound, 21-year-old who enlisted to “make a difference” in Afghanistan. Instead, I aim only to complicate the notion that he is an unambiguous hero, whose efforts to procure justice were thwarted by the military at large. What’s more, Krauss’ focalization on Winfield’s vantage point comes at the expense of broader conversation about the military’s admittance policies and the ethical challenges of counterinsurgency. What we learn about the crimes is truly heinous: American soldiers were strategic about camouflaging their murders. They dropped guns next to their victims to make them appear armed and exploded untracked grenades, blaming Afghan spectators for the deaths of innocent civilians. Specialist Jeremy Morlock, who was convicted of three counts of premeditated murder, called a “warrior’s paradise,” where the rules of engagement were questioned and fog of war took over. By all accounts, the perpetrators were bored, impressed by Sgt. Gibbs’ machismo and eager to win his approval. The murder victims included a disabled man, an Islamic mullah and a 15-year old boy, Gul Mudin, who was working on his father’s farm. American soldiers stripped Mudin’s corpse, severed the boy’s pinky finger as a trophy and posed for photos with his mutilated body. Krauss makes no move to explore the effects of these killings on Afghan communities. Meanwhile, he spends much of the film portraying the Winfield family, observing legal briefings and dinner-table conversations. What emerges is a heart-rending portrait of a family under stress and parents fighting to keep their son out of prison. Ultimately, though, it’s a bit difficult to get behind the idea that an American family is the primary victim of the Maywand District murders. The film’s silence around Afghan suffering is disturbing. “The Kill Team” is not an even-handed interrogation of the war on terror, its psychological realities or dubious operating procedures. It claims a monopoly on moral outrage but does more to impoverish than enlighten our conversation about military culture and policy. In the end, this is not a principled documentary. This is a disappointment.